The automatic garage door opener is an absolute blessing. There used to be a day when people would have to get out of their car, in the rain, snow and heat, and use their muscles to open hundreds of pounds of wood or metal rolling doors just to get in to their garage. Today, thankfully, none of that is necessary. We just use the muscles in our finger and boom it opens. Unless your automatic opener fails, that is. Your garage door opener is most likely your most used appliance in your entire home as far as workload goes. Garage door openers usually last for many many years at a time without having issues. Generally after thousands of uses you will have some complications and it may break down. This is not the time to panic. Give us a call and we will be on our way. Over 80% of the time it’s a quick fix and very inexpensive. Garage Door Repair Gilbert is the leading provider in the Gilbert, Chandler, Apache Junction, Queen Creek, Phoenix, Mesa East valley Area. We’ve been helping homeowners for over a decade now with the best service available. Although there are lots of reasons why your unit may malfunction, most common causes include electrical problems, loose connections, worn sprockets or gears, sensor blockage antenna failure, remote controls, electronic circuitry, wall switches, and lights are another common area of vulnerability. Few of these are easily identified by sight. Our technicians have tools and high tech mechanisms that have the ability to quickly identify the issue. The biggest danger is the electricity used to power your automatic opener. Electricity is never safe for DIY repairs, and this is no absolutely no exception. There are safety sensors put in to place for a reason. If the sensors or reversing mechanism fails, serious injury and damage can occur. Safety sensors required for today’s equipment protect most importantly your family 1st, and your vehicle, preventing the door from closing on, or crushing anything that crosses it’s sensors. Automatic garage openers also offer a high level of security, which will protect your home if anything breaks on your mechanism. Your cars, property, tools, and other valuables are at risk not to mention unwanted entry into your home. A lost or stolen remote control leaves you very vulnerable to hackers, home invaders, and criminals. Garage door openers can run into many different complications. The pulley mechanism may malfunction, the remote control can stop functioning, and it may have problems receiving electricity and power at times. Every one of these issues are complications that our highly trained skilled technician can repair at an affordable cost. Often times older systems simply cannot be repaired. If this is the case, Gilbert Garage Door Repair offers the best garage door openers on the market. Allstar, Chamberlin, Guardian, Linear, Stanley Lift Master, Marantec, IntelliG, Wayne Dalton, and Genie are just a few of our openers and motors we service. 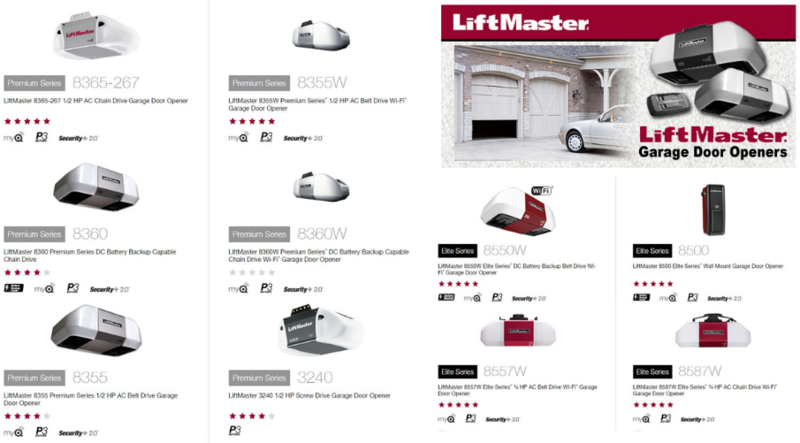 These brands are very energy efficient and have a much longer life expectancy than previous garage door openers. What makes these new openers more valuable is the safety measures they’ve put in place to insure the safety of your garage and your home as well as life. One of the first signs to having a garage door problem is the noise. It can be a grinding noise or often it starts as a quiet squeaky noise that gets progressively worse. Do not ignore these noises. These are signs and if left unattended can turn what would’ve been a cheap and easy fix into a major repair.